Paige Tate Select, 9781944515096, 80pp. 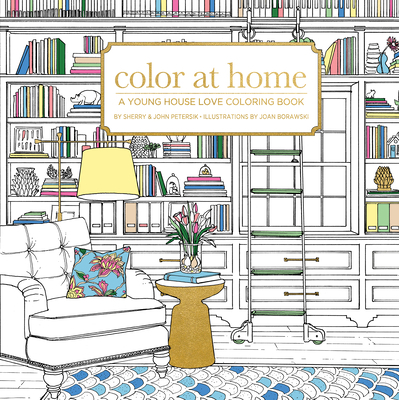 New York Times best-selling authors Sherry & John Petersik of the popular home blog Young House Love have teamed up with Paige Tate & Co. for a one of a kind, interior design coloring book. Dive into beautiful rooms and home decor inspiration illustrated by the talented Joan Borawski. Get lost in intricate design details like built-in bookcases, patterned pillows, and ornate rugs - and bring them to life with your own color schemes. Each page is printed on white premium paper and offers countless opportunities to experiment with different looks without having to repaint a room or buy new furniture, so you can test drive different styles and color combinations before committing to them at home.